One of the main focuses of Medical Device and Technology companies is ensuring that the products they are developing meet safety and quality regulations. This requires the devotion of a significant amount of resources, as the quality checks occur throughout every stage of the product life cycle, from R&D and product development through manufacturing. Given the evolving nature of the quality function, Best Practices developed a benchmarking report that delves deeper into the key issues and questions being asked throughout the Medical Device industry. In order to improve overall effectiveness and ensure product safety, companies must better understand the Quality function. As evidence in the graph provided below, the Quality function in the Medical Device industry is only growing larger and gaining more importance. 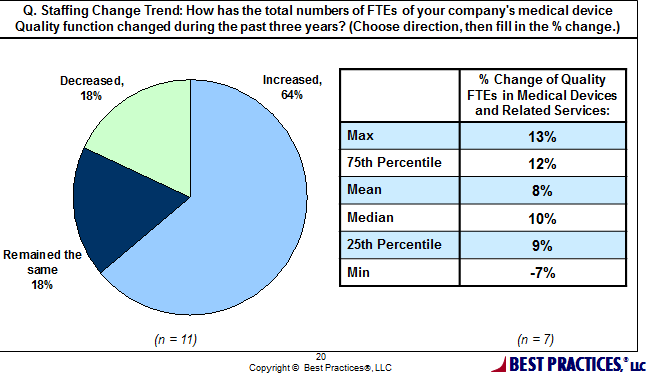 Almost 2/3 of the benchmark class indicated growth in Quality function staffing of full-time employees over the past 3 years. With budget cuts, one might believe that it would be realistic for executives to cut headcount in these departments to save costs. Despite this thought, reducing Quality headcount exposes the organization to various risks and increases the opportunity to fall out of compliance. Ensuring the safety and quality of consumer products is essential, and slowing the growth of the Quality function, rather than reducing headcount, is a more realistic objective at this time. Although the quality function primarily deals with Quality and Risk evaluations, it’s important to keep in mind that quality is everyone’s responsibility. Quality is more than product design, and should be evaluated and managed by employees throughout the company. It is important that all associates understand Medical Device regulations and how they affect the company. However staffing changes may be occurring in individual companies, the Quality function will always be an essential element to the success of products.